Download manager WordPress plugins allow users to control and track downloadable files within your WordPress website. These downloadable files can be pdf files, media files, ebooks and so on. Along with that, download manager plugins will provide you an exalted file management directory, which helps you to ease up your downloads management task. This consequently leads to more organized and controlled approach to your website. There are numerous download manager plugins available in WordPress repository. How will you choose the best one from the cluster of download WordPress plugins? In this article, there’s a compilation of 7+ best download WordPress plugins, which extravagantly manage files downloads and please your website’s visitors by enhancing user experience. 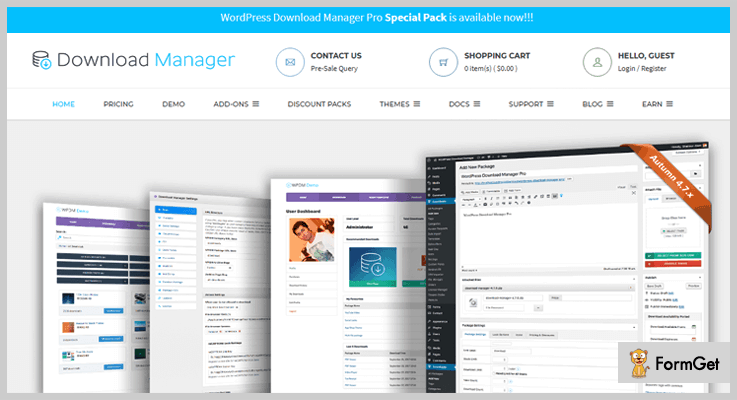 WP Download Manager Pro is all in one plugin and considered the best among all download WordPress plugins. This plugin is also a complete e-commerce solution for selling digital products. It is filled with lots of rich features that you’ll ever need for monitoring file downloads. Moreover, it helps you to track user activities, control over all downloads. This download WordPress is proudly used by over thousands of companies and one of them is Microsoft. Free Plan: It includes features like limited access control, password protection and WP multisite support for many domains. Professional: $45, with free plan features and premium features like a multi-file package, individual file info, multiple passwords, download stats and extended access control and lots more for 1 domain. Business: $125, includes Pro plan features for 5 domains. Developer: $210, includes all the features of a Business plan but for unlimited domains. Control user who are permitted to access the downloads and who are forbidden. With this plugin, you can also control the speed of download using bandwidth control. The plugin is fully SEO optimized and compatible with All in one seo, Yoast SEO etc. Download statistics which helps you to monitor who is downloading and a number of maximum download from a particular server. 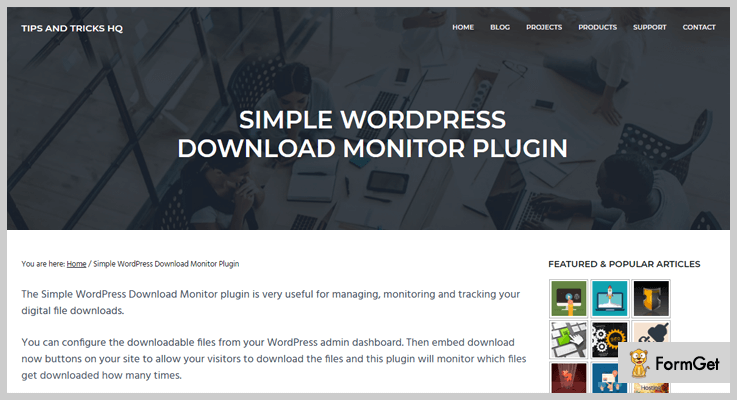 The Download Manager WordPress plugin has more amazing features, Click the button to explore. 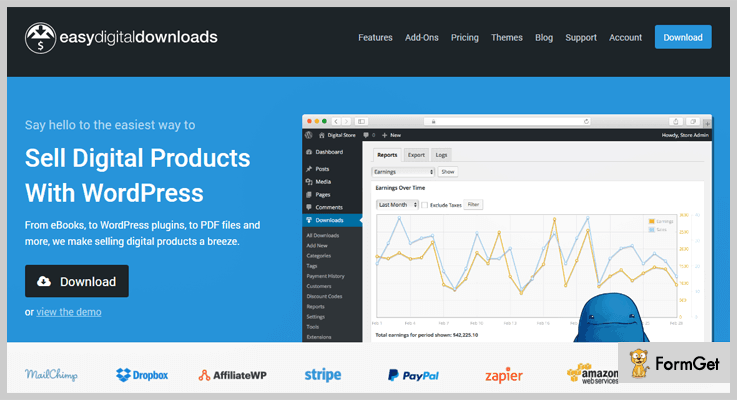 Easy Digital Downloads enables you to sell digital downloadable products from WordPress site. With the help of this plugin, you can hassle-free sell products like PDF, Ebooks, and even WordPress plugins. Apart from this, it also offers some extended functionalities such as Stripe payments, MailChimp, software licensing, and recurring payments etc. Free Plan: Includes features like shopping cart system, discount codes, customer management tools, and data reporting. Starter: $108.50, with broad extension selection, automatic 30% discount etc. All Access Pass: $125, includes unlimited license key usage, 55 extensions included and many more. Furthermore, additional extensions starting from $19. The plugin gives you complete report and downloads statistics. Provides you Rest API which helps you to access product and sales information in XML or JSON format. Allows your customers to download their purchased files unlimitedly. It has a cleanly designed shopping cart system which allows your customers to download multiple products. And so on. 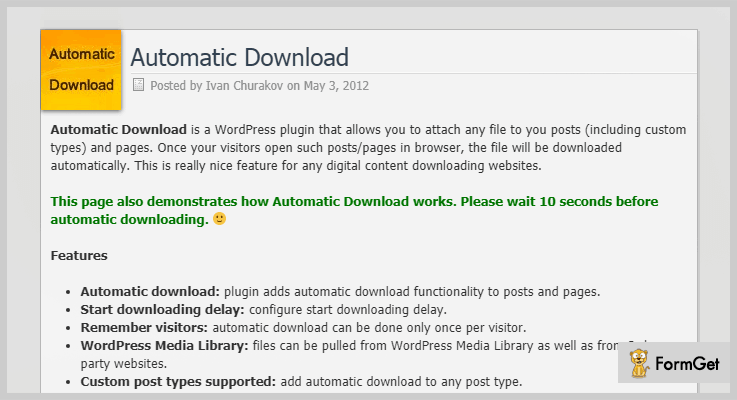 Automatic Download WordPress plugin has got an amazing functionality of automatic download. It allows you to attach any files to posts and pages. Suppose your visitors come across a post in which file is attached on your website then, that attached file will be automatically downloaded on user’s browser. This WordPress Download manager cost you $12 on purchasing from the Codecanyon.net. The plugin remembers the visitors. Hence, the automatic download occurs once per visitor. Automatic Download supports mobile devices. You can on/off the functionalities using mobile. Files can be imported from WordPress media library as well as from external resources. It can be translated to any language and lots more. Subscribe & Download WordPress plugin allows your visitors to download the files only after subscription. For example, if visitors want to download something from WordPress website, for this they have to submit their details in the submission form. After this, they receive an encrypted one-time download link via email. All the contact details of customers is saved in database or you can import to MailChimp, GetResponse, iContact and many other email service tools. You can purchase this Download WordPress plugin at just $16. It also provides extended email address validation. The plugin support shortcodes. You can insert it into your content. Autoresponder email from MailChimp, AWeber, Campaign monitor etc are also supported. 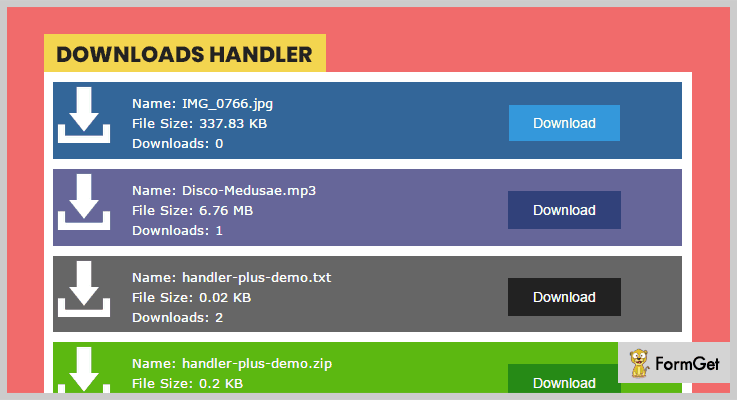 WordPress Downloads Handler Plus is one of the reliable download WordPress Plugins which handles and tracks your downloads seamlessly. The best thing about this plugin is that unlike others it does not add extra load to your website. Therefore, it is very light-weighted and simple. The plugin cherishes you with beautiful download boxes which shows file information and number of downloads directly on your posts. Get this plugin from Codecanyon.net at just $20 only. You can restrict downloads to any user. Add external links from remotely hosted files. 5+ color skins for download boxes and buttons. 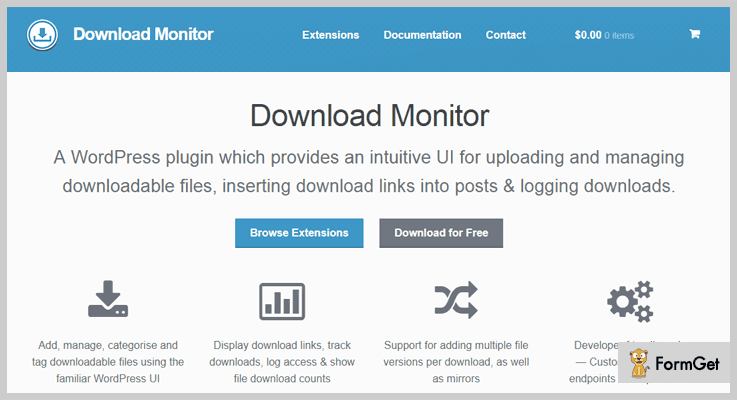 Download Monitor provides you an easy approach to controlling and managing downloadable files. You can easily insert download links in posts and pages of your WordPress websites. It gives you the flexibility to change the display of download links via templates. Likewise, you can also display links on the front end using the shortcode. Get this plugin for free from the WordPress.org. You can add, edit or delete download links from the WP interface. 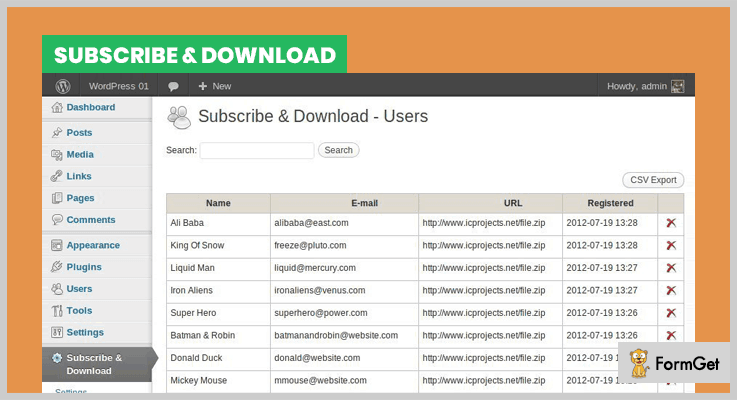 Add category, tag, and other metadata to your download links. Add multiple file version per download. It provides us a developer friendly code, custom post types, and end point templates etc. Simple Download Monitor gives you a satisfying way to manage your digital downloads and track the number of downloads of your files. This plugin gives you the facility to protect your files or documents through passwords. It gives you an option to show an ajax file browser and let your visitors browse all your files easily. This Download WordPress plugin is free of cost, available on the official WordPress site. Provides rich text editor to edit the description of the downloadable item. Track date, time, and IP address of the user who downloaded a product. Secure downloads by hiding the downloading page URL. You can add “Download Now” button to your sidebar widget. Well, this is our take on the best download WordPress plugins. If you really want to manage your files download then there is no better option rather than these above-mentioned download manager plugins for WordPress. Hopefully, you’ve found the best match download WordPress plugin for your website.